If you find yourself in the Northern Hemisphere as you read this, then you know it’s winter. In an attempt to be a good Canadian and a proud former Montrealer, I've rounded up our favourite affordable ways to keep happily distracted when the air is hurting your face. So bundle up and get cozy: here’s 10 activities to embrace Montreal winter affordably! Where & when: any Cabane à Sucre (outside city – here's a list of 5 great ones). In Old Montréal you can find a small wooden stand that sells smoothies in summer & maple taffy in winter. The stand is located on Place Jacques Cartier, between Rue Le Royer East and Rue Notre Dame (before the Montreal City Hall). In winter, Old Montréal has a wonderful wintery set-up complete with a Cabane à Sucre (sugar shack) which serves maple taffy. This delectably sticky creation is made by pouring hot maple syrup over fresh snow, which then stiffens and is rolled on a popsicle stick. Prepare for an instant maple-y party in your mouth. Want a truly immersive Canadian winter experience? Why not try an ice wine tour which includes a maple taffy tasting. What are two things to cozy up with on an icy cold day? Coffee. And cats. Montréal's Cafe Chat L'Heureux is as it sounds, a café where kitties (adopted from the SPCA) can roam freely, be patted, and hop on your table as you sip your latte. The idea originates from Japan, and has been a hit in Montréal. If you're in Montréal when it gets a good dumping of snow, make a beeline for Mont Royal. Right in the downtown area, this tree-filled, enormous slope offers a top notch lookout of the city. On snowy weekends, locals snowshoe, sled, and cross country ski to the top for postcard perfect views. Other city parks are nearly just as enticing. Just add snow and a willingness to brave the cool temps, and you won't regret stepping out the door. As it turns out, winter is much more bearable when you add chocolate festivals, winter raves, randomly dispersed fireplaces, and Christmas-themed walking tours. For more fun, free activities (including meeting Santa himself), pop over here. Montréal is colourful in its culture, array of people, and majestic architectural sights. Do not miss the delicately crafted Notre-Dame Basilica. Its jewel-toned colours and ornate fixtures will make you feel as though you're somewhere far away in Europe, in spite of the chilly Canadian air ushering you in. Keen to explore the city's other main attractions? The Montreal Attraction Pass is a good bargain if you're planning on visiting many attractions. Entry includes the Biôdome, Museum of Contemporary Art, Museum of Fine Arts, the Planetarium, and more (take note, it doesn't include entry to the Basilica). Each of these sites is ~$20+ CAD for entry, while the Attraction Pass is $110 CAD total. Basically, if you're visiting five attractions or more, the pass is definitely worth it! Montréal's abundant markets are a great place to feast the eyes and tickle the tastebuds. From humble Atwater stuffed with local cheese and crisp produce, to the bigger, broader Jean Talon, offering rainbows of macarons to the piniest-smelling Christmas trees. If being indoors is what you're looking to do when it's cold, hit up a market for a cozy change of scenery. Food fiends and those wanting to learn more about local cuisine can partake in a Beyond the Market food walking tour. This includes a visit to Jean Talon market, Mile-Ex district, and plenty of food samples along the way. Back in the 1600s, Montréal's waterside port was one of Canada's major fur trading posts. Today its cobblestone streets and old architecture continue to ooze that European je ne sais quois. You can peruse the streets on your own or take a Christmas walking tour and learn about the city's European holiday traditions and history. More often than not Montréal corners and formerly bare walls will reveal a cheeky mural or two. This is visually apparent throughout the downtown, especially in the Plateau area which is peppered in wall art of all styles and sizes. Simply bundle up, bring a camera and take a stroll! Cost: Your own spending limits! Rue St Catherine which has several indoor plazas including the Centre Eaton, les Cours Mont-Royal, the Complexe Les Ailes and Place Montréal. Rue Sherbrooke is ideal for those seeking high-end shops. Between Guy and Montagne one can find many adorable boutique shops. Place Ville Marie has even more fashion shops galore! The Plateau is idealfor hipster finds (located Sherbrooke Street downtown to east of Mont Royal), great for offbeat finds and cozy bookstores. Montreal has plenty to offer in the way of shopping, even for those on a budget. Many of the city's department stores put on elaborate Christmas window displays. Such stores include The Bay, Noel Eternel, Plaza St Hubert and more. Crispy browned fries. Squeaky cheese curds. Rich aromatic gravy. This folks, is a Canadian work of art, and it's called the poutine. Being the inventor of this Canadian culinary icon, Québec is a little poutine cray cray. It's basically a staple at every restaurant and deli, with some boasting as many as 20+ flavours. My advice? Try them all. They are after all, the cure for chilled bones on a frosty day. Poutine in a burger? Heck yes. Jukebox = a Montreal must-try. Winter haters needn't be short of things to smother the cold this time of year. Montréal is teeming with festive activities, most of which are cost-free or just a few dollars. So bundle up, get out of the house and embrace your inner snow bunny! Are you a winter hater or lover? 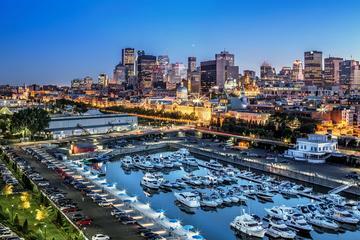 What are your fav Montreal outdoor activities & sights?